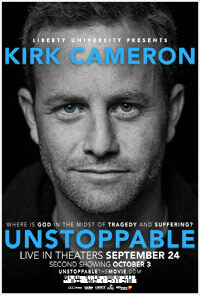 Due to overwhelming demand, a pre-recorded encore presentation of UNSTOPPABLE: A LIVE EVENT WITH KIRK CAMERON will broadcast to select movie theaters on Thursday, October 3 at 7:00 pm including the Regency 20 near the Westfield Brandon Mall. The original live event will take place on Tuesday, September 24 from The Vines Center at Liberty University in Lynchburg, Va. Due to high demand from theaters that have already sold out of tickets, a second showing has been scheduled in select theaters. UNSTOPPABLE is proving to be more than another indie-film project as it is currently trending number one in tickets sold in the past 24 hours on movietickets.com, ahead of such blockbuster studio releases like Insidious: Chapter 2 and The Family. Last week, Cameron appeared on several national news and entertainment programs including Fox & Friends, Fox News, The Today Show, Huckabee, and Entertainment Tonight. Interest from audiences and media outlets continues to escalate since it was discovered that both Facebook and YouTube initially blocked the trailer labeling it as “unsafe” and “abusive.” After Cameron’s supporters rallied online support, the incident was resolved. Combining thought-provoking discussions with music and artistic vignettes, UNSTOPPABLE investigates the origins of good and evil and how they impact our lives and our eternities. Tickets are available through www.unstoppablethemovie.com or www.Fathomevents.com.